highest r-values in the industry. and sealing gaps, cracks and openings. Always remember, even as the weather gets warmer, tanks must be warmed to between 75º-85º to give the best yield! Enter coupon code SAVE50 during checkout and receive a $50 savings off of any two size 600 kits you order. Offer applies to any combination of 2 TF-600FR, TF-600SR, and TF-605 kits. Max savings $50 per order. Traditional insulations leave gaps and spaces, where air infiltration becomes a major source of energy loss. Tiger Foam seals spaces completely, creating an effective vapor barrier that prevents air leakage and the heat transfer that goes with it. For both commercial and residential applications, spray foam provides the best air sealing proporties and highest R-Value per inch. It’s no secret that proper insulation provides signifacant annual savings on heating and cooling costs. 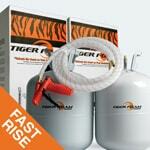 Buildings and homes insulated with Tiger Foam can easily recoup the install costs through lower utility bills. Our kits are self-contained and 100% recyclable. They come complete with all the accessories needed to start spraying. You’ll be saving money as soon as the foam is dry! Closed Cell, Fast Rise Formula: For new construction and open walls. An ideal choice for attic insulation and crawl spaces. Open Cell Formula: For soundproofing and other specialty applications. Trying to decide what type of foam you should use for your jobs? It’s trickier than it seems – though closed cell and open cell foam both insulate a home, they do it in different ways. Read our guide where we examine open cell vs closed cell foam and help you pick the best product for your project. 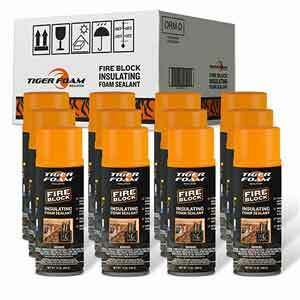 Tiger Foam™ is a proven leader in providing spray foam kits, supplies and accessories to homeowners and contractors alike. We offer retail sales for small projects and wholesale, bulk pricing for bigger jobs. Our expert customer service team is always available to answer questions and help plan projects. Whether you’re trying to save money on your monthly energy bills or working to satisfy your customers, Tiger Foam can help. Most of all, our products provide high performance and great value. Become a customer today and get you the tools you need to start saving energy dollars! 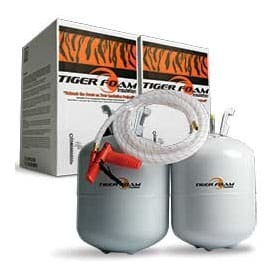 Tiger Foam™ Closed Cell Spray Foam has one of the highest R-Values in the industry. 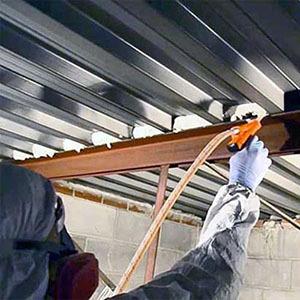 Tiger Foam Insulation™ quick curing, recyclable, two-component polyurethane spray foam insulation kits are manufactured to ASTM E-84 Specifications and classified as a fire-rated foam insulation. All of our insulations are manufactured using the best quality blowing agents and fire-retardant chemicals available today and DO NOT contain CFCs, VOCs, Formaldehyde or PENTA-BDEs and avoids their associated environmental and health effects. 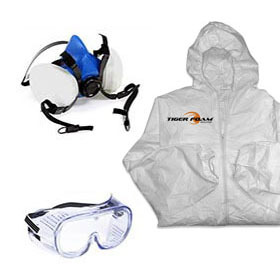 All of Tiger Foam Insulation's™ polyurethane foams should always be used in conjunction with a certified respiratory program in addition to safety glasses or goggles, nitrile gloves and clothing that protects from skin exposure. Huge Savings! 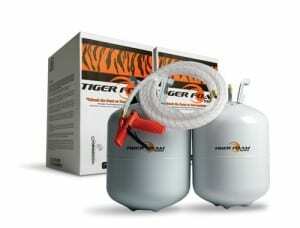 - Homes insulated with Tiger Foam will start saving money the day you install your spray foam. Installing spray foam insulation will pay for itself by lowering your energy bills every month. Air Barrier - Leaks cost you a bundle. 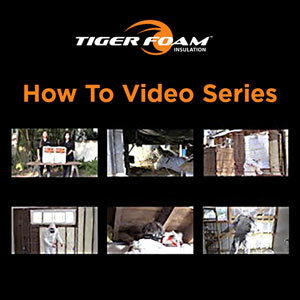 Even adding just 1 inch of Tiger Foam to your home's insulation can vastly reduce unwanted air leaks. 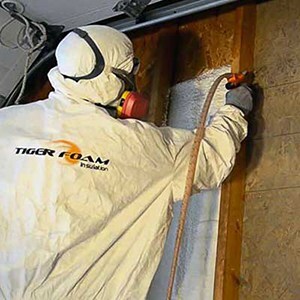 Vapor Retarder - Unlike open cell spray, cellulose, or fiberglass insulation, Tiger Foam's closed cell insulation is practically waterproof. 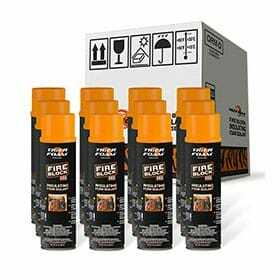 Simple - Tiger Foam kits are designed for easy use, you get the results you expect from the very first time you spray. Simple instructions, toll free support, how-to videos, and 100% guaranteed against defects. Does Not - contain CFC's, VOC's, PENTA-BDE's, or Formaldehyde. Quick & Easy - Just spray it on and Tiger Foam rises roughly to 1 inch of thickness. 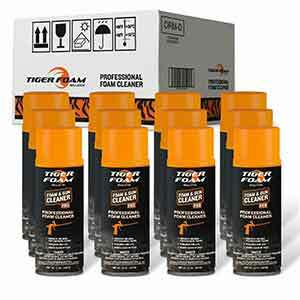 Pest & Mold Resistant - Tiger Foam cannot hold moisture, which makes it mold resistant. Tiger Foam has been engineered so insects, rodents, and other pests will disregard it as a food source.